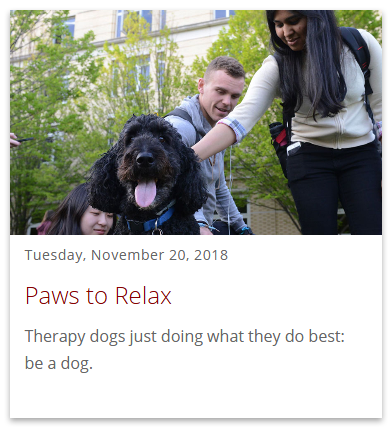 News Article pages are ideal for stories, press releases, events, announcements, blog posts, media mentions, promoting important topics... they are so versatile! News Article pages work with News Index pages to provide a directory listing of news. Example of a News Article page. 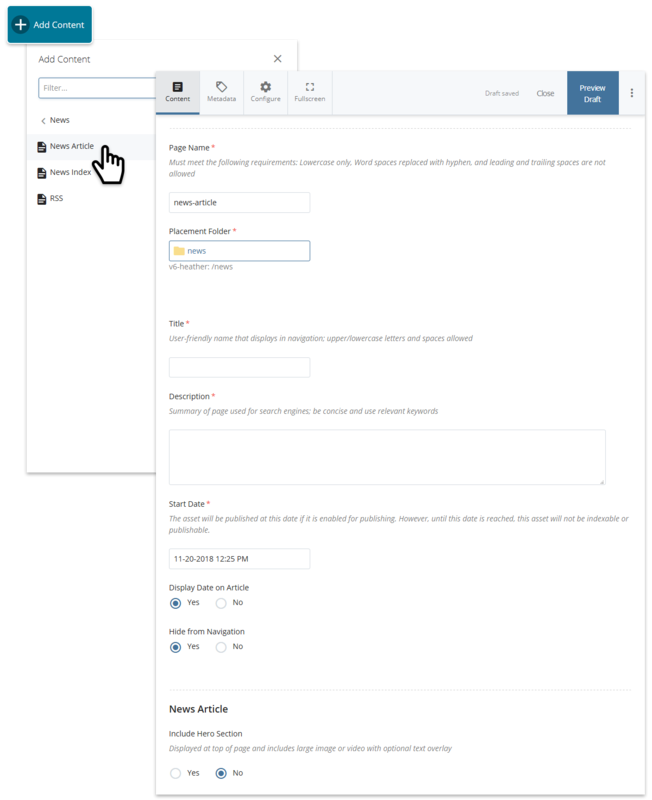 Ideally, News Article pages should be contained within a designated news section on your site; if you're starting from scratch, review the folder structure recommendations and create your folders for your news section. Start Date - Specify a timestamp for the article. Note: a date set in the future will publish the page on that date; more on scheduled publish. 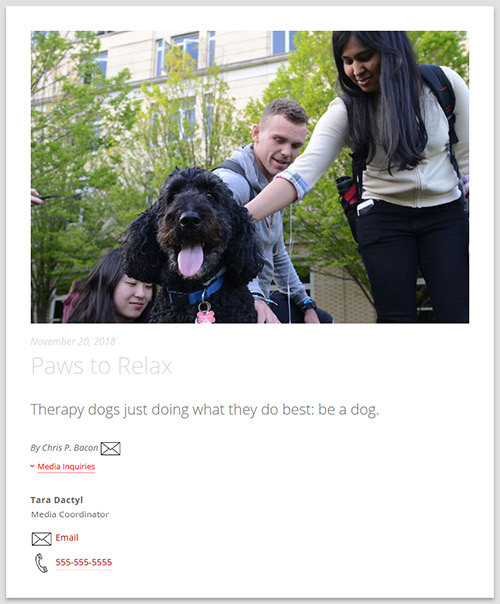 Creating a new News Article page. Syndication allows the News Article to be featured elsewhere, such as on News Index pages, Hero rotators, and social media when the page is shared. If enabled, complete the Hero Syndication fields for Hi-res Image, Mobile Image, Heading Text, Sub Text, Link Text (for more information on these fields, see Hero). Example of syndication information on a News Index page. Example of image, subheading, byline and media inquiries; media inquiries is collapsed by default and can be expanded by clicking the Media Inquiries link. Categories allow filtering on News Index pages. Specify what categories the News Article should be tagged with (new categories can be created in the categories block; more on categories). 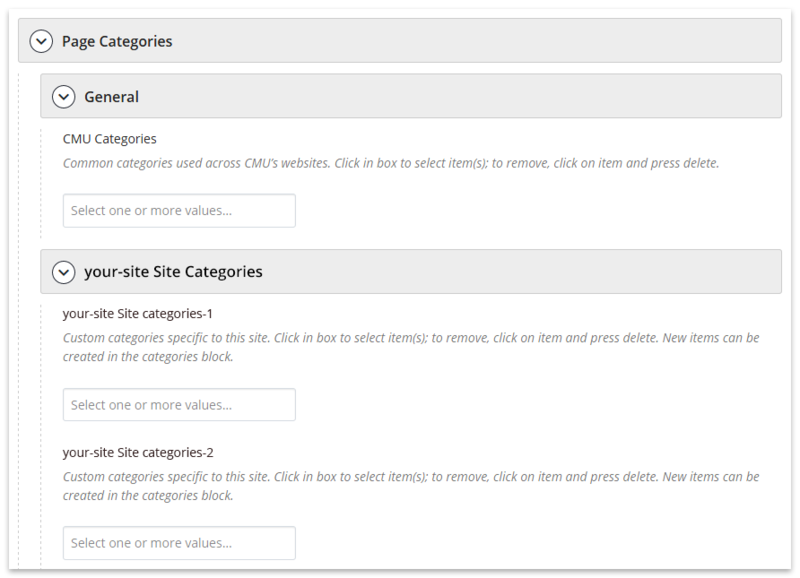 Click in each box to select one or more categories; to remove a category from being selected, click on it and press delete. Page categories in the page edit interface. 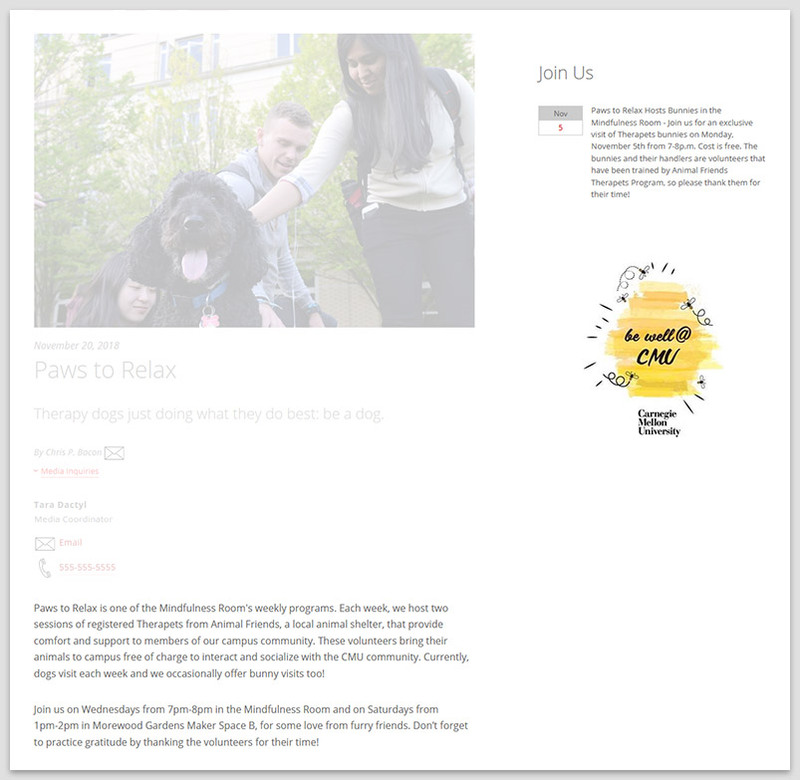 Example of main content and two sidebars (event list and WYSIWYG) on page. 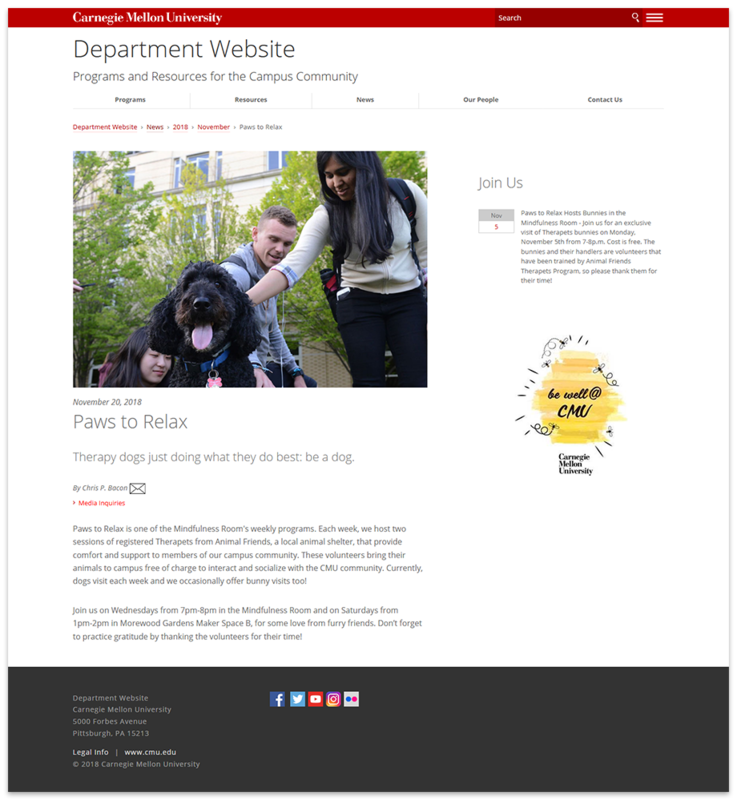 Include a standard content area at the bottom of the page to enhance it with any of the content types (WYSIWYG, grid, slideshow, wide). Click the plus sign (+) to add another content area. 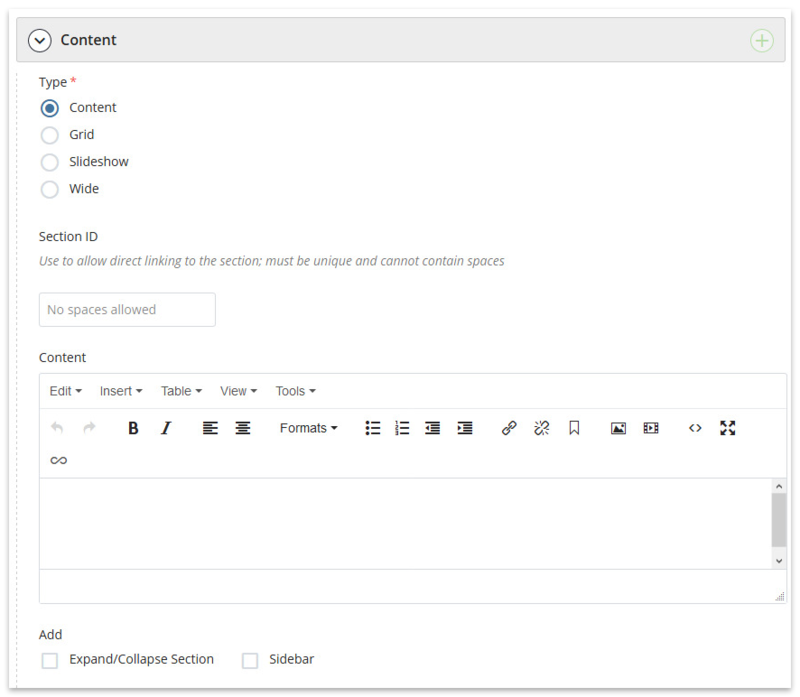 Additional content area in the page edit interface. Done? Save & Preview or ⋮ Submit. Learn about the save options.